Today we take a guided tour of Old Delhi, the 17th century walled city of Shah Jahanabad, Visiting the great Jama Masjid, the principal mosque of Old Delhi. Built in the year 1656 AD by the Mughal Emperor Shah Jahan, it is the largest & best known mosque in India. Later we walk down or take a rickshaw ride through Chandi Chowk, the old marketplace of Shah Jahanabad now a picturesque bazaar to reach Red Fort, built in the year 1648 by Shah Jahan. Check-out from the hotel at 1200 hrs. Evening transfer to railway station to board night train to Jodhpur. Today in the morning we arrive Jodhpur. Set at the edge of the Thar Desert, Jodhpur is the second largest city in Rajasthan & once was the capital of the Princely State Marwar. It was founded in the year 1459 AD by Rao Jodha, chief of the Rathore clan of Rajputs & its landscape is dominated by the massive Mehrangarh Fort. While the graceful palaces, forts & temples strewn throughout the city bring alive the historic grandeur, the exquisite handicrafts, folk dances, music & the brightly attired people lend a romantic aura to the city..
Day free in Jodhpur. Checkout from the hotel at 1200 hrs. Late evening transfer to rail-station for Jaisalmer night train. Night on board.Overnight train. Check in time is 12 noon. Jaisalmer, founded in the year 1156 by Bhatti Rajput ruler Rawal Jaisal. Often described as Golden City & rising from the heart of the Thar Desert like a golden mirage the commanding Fort etched in yellow sandstone, dominates the amber-hued city with its entire awesome splendour. Because of its strategic location it was an important ancient trading centre & camel caravans laden with precious spices & silk crossed the territory en-route India, Sindh, Arabia & Europe. The merchants of the 19th century built Havelis (Mansions) that are exquisitely carved from golden-yellow sandstone & are still in a beautiful condition. The life within the Fortified town conjures up images of medieval majesty visible in its narrow lanes strewn with magnificent palace, havelis, temples, & of course skilled artisans & ubiquitous camels. Today we visit the old town of Jaisalmer & visit Jaisalmer Fort, built in the year 1156 by Rawal Jaisal. Perched on 80m high hill, housing the entire township within its ramparts, the golden hued Fort is standing like a sentinel in the bleak desert landscape. It is the only “Living Fort” in India & within its ramparts has an enchanting cow-web of narrow lanes dotted with some lovely Havelis (Mansions), Palaces & beautifully sculptured Jain Temples of the 12th-15th century AD & of course skilled artisans & ubiquitous camels. Overnight hotel – Jaisalmer (B). Day free in Jaisalmer. Checkout from the hotel at 1200 hrs. Late evening transfer to rail-station for Jodhpur night train. Night on board. Morning arrive to Jodhpur, then drive to Udaipur visiting Ranakpur Temples enroute. Ranakpur - 98 kms from Udaipur, the Jain Temples built in the 15th century are situated in the lovely valley of the Aravali. Its surrounding is quiet and picturesque. Ranakpur has grand structures and beautiful sculpture. There are 1444 pillars in the temple and none of them are similar. The magic of light & shade is really awe inspiring. Surya Temple and other Jain Temples are side attractions. Udaipur was founded in the year 1568 by Maharana Udai Singh after his final unsuccessful attempt to defend the Mewar capital, Chittorgarh from the invading Mughals under Emperor Akbar. The Kingdom of Mewar was considered the most respectable among all Princely states in Rajasthan & still remembered for the courage to protect the Kingdom. The site for Udaipur was chosen for its natural beauty, abundant water & natural protection afforded by the surrounding forests & Aravali mountains. It is set on the edge of three lakes & also known as the "City of Lakes & Palaces". Undoubtedly one of the most romantic cities in India, its beautiful Palaces are mirrored in the calm waters of Lake Pichola & the city is a brilliant kaleidoscope of narrow lanes flanked by bright stalls, gardens, lakes, palaces & temples. Overnight hotel - Udaipur (B). Morning free. Checkout at 1200 hrs. Evening transfer to rail-station for Jaipur night train. Morning arrive Jaipur popularly known as Pink City, the flamboyant & colourful capital of Rajasthan. With its rich & colourful past, resplendent with tales of valour & bravery, it is now one of the most important heritage cities in India. The city was founded in 1728 by Maharaja Sawai Jai Singh II, the ruler of Amber. It remains the only city in the world symbolizing the nine divisions of the universe, through nine rectangular sectors. Afternoon we visit the City Palace, a perfect blend of Rajasthani & Mughal architecture. The center of the palace is a seven-storied building called Chandra Palace, with fine views over the gardens & the city. Further we visit Jantar Mantar, the Solar Observatory, an astronomical treasure house, with solar devices that give accurate predictions till date. 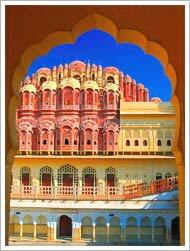 We now visit Hawa Mahal (Palace of Winds), a five-storied structure of pink sandstone. It was built in the year 1799 so that veiled royal women could peer down the busy street market unseen by the world through its 593 stone Jharokas (mini windows). Today in the morning we take an excursion to Amber Fort (11 km); the palace complex which stands to this date was commenced under the reign of Raja Man Singh. We take an Elephant ride to reach the Fort situated on the hill, an overwhelming experience. Later transfer to rail-station for Agra train. Late evening arrive Agra . Transfer to hotel. Overnight hotel - Agra (B). Today in the morning we visit Agra Fort, taken over from the Lodhis by the Mughal Emperor Akbar in the late 16th century. The Fort can be more accurately described as a walled palatial city. It was built from red sandstone, often inlaid with white marble & intricate decorations. We will also visit Sikandara, Akbar's tomb. His son Jahangir completed the construction of the tomb in the year 1613. Afternoon we will visit Fatehpur Sikri (Ghost Capital), the political capital of India's Mughal Empire under Akbar's reign, from the year 1571 until 1585, when it was abandoned, ostensibly due to lack of water. We visit Emperor Akbar's Residential complex, Mosque & Tomb of Salim Chisti. Overnight hotel – Agra (B). Today in the morning we visit Taj Mahal, symbol of eternal love, which stands on the banks of River Yamuna. It was built by the 5th Mughal Emperor, Shah Jahan in the year 1631 in memory of his wife, Mumtaz Mahal. It was completed in 22 years. Check-out at 1200 hrs. Evening transfer to rail-station for Delhi train. On time transfer to international airport to board flight for onward journey.